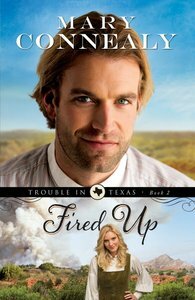 About "Fired Up (#02 in Trouble In Texas Series)"
Customer Reviews For "Fired Up (#02 in Trouble In Texas Series)"
Fired Up has solid characters, an adventure-filled plot, a strong Christian message and is an easy if lightweight read from the Queen of the Christian Western. I enjoyed reading it, but can't say there was anything especially memorable about it, nor any reason to continue with the series. Fired Up is the sequel to Swept Away, which I have also reviewed. There's enough recap of the Swept Away story for Fired Up to be read as a stand-alone novel, although it's more enjoyable read as part of a series (it's possible there was too much recap, but I could hardly remember the first story so it was welcome). I loved it! I laughed like crazy in some points and almost chocked on my drink from laughter in a few other places. I was just so happy to read a well constructed, well written and funny book. It was the perfect remedy for a disappointed reader. It improved my mood and made my like books again!